Heat the olive oil over medium high heat in a large pot. Remove the casing from the sausage links, and add the sausage to the skillet. Break up the meat as it cooks. When the meat is browned, add the rice, lentils, broth, and seasoning. Bring the pot to a boil, then cover and reduce heat to low. Leave at low heat for 20 minutes (don’t remove the lid!). Gently stir in the tomatoes, and heat through until broth is absorbed. I like to use turkey sausage for this (just a taste/texture preference). You can find it with the ground turkey at the grocery store, in packages with five links. I like the hot sausage as opposed to the sweet, but either one works good. 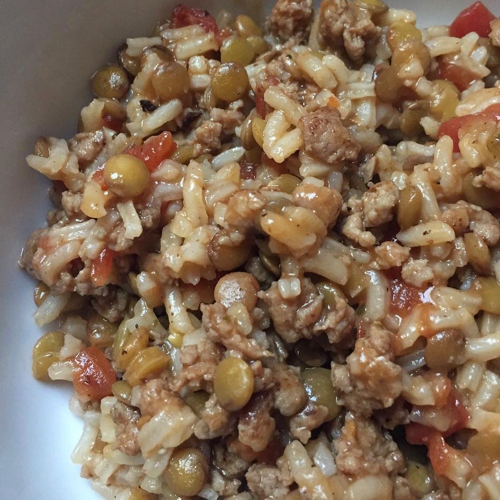 You can make this with brown rice, but I would suggest cooking the rice in beef broth separately and then folding it into the lentils at the end. White rice cooks in the same amount of time as lentils, so it works well for this recipe. The lentils will be mushy if you cook them too long. Don't stir or open the lid while it's cooking, otherwise the rice will get mushy and gummy. You can skip the tomatoes, if you like. I used to make it without tomatoes, and then added them on a whim one time, and it was good! I found a recipe for Crock Pot Jambalaya that I want to try too -- this is going on the list next to that! It's so delicious--let me know how you like it! Thanks so much for the recipes! We've done the emergency pasta several times now... it's so good!! Well... cooked it last night... threw in some taco spices and called it Mexican rice, and my kids cleaned the plate. Thanks so much for posting these quick recipes! I made this tonight and we love it! It was super easy to make and tastes great. It makes enough for leftovers the next day. Love your recipes. Thanks! Weight Loss Success: How Caitlin Lost 240 Pounds! Mental Health Monday: A Runner's High!